Get Stormy was represented by two winners on Sunday as Dolly Stormy won an Allowance at Woodbine by 3-3/4 lengths and Storm Monster won a Maiden Special Weight at Mountaineer by 2 lengths. Got Stormy upset a salty field in the $200,000 Penn Oaks on Saturday, going one mile on the turf in 1:34.3 which was faster than the $500,000 G2-Penn Mile run later on the card. DRAGON DREW BECOMES GET STORMY’S NEWEST STAKES WINNER! Dragon Drew, a three year old colt by GET STORMY, beat a tough field by four lengths in the $50,000 Black Gold Overnight Stakes at Fair Grounds on Saturday to become his sires newest stakes winner. Congratulations to owner, breeder and trainer Buff Bradley and his partners on this exciting three year old! Buff mentioned that a possible next start would be the $150,000 G3-Transylvania Stakes at Keeneland on April 6th. Get a Valentine, a four year old gelding by GET STORMY, won an Allowance gate to wire on Friday at Fair Grounds for Joe Sharp and Brad Grady! 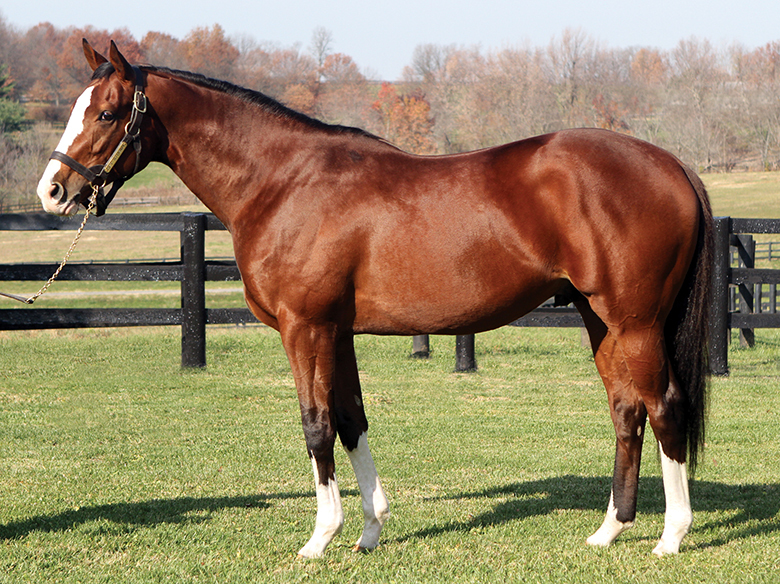 He set impressive fractions 22.07, 45.09, 56.44, and finished the 5-1/2 furlongs on turf in 1:02.48 to win by two lengths! One Lovely Storm, a four year old mare by GET STORMY, won a one mile Maiden Special Weight at Turfway Park on Thursday by 6-3/4 lengths. Recent Gulfstream Allowance winner Storm Runner (GET STORMY) will be pointed towards the $400,000 G2 Fountain of Youth at Gulfstream as a Derby Prep. Dragon Drew, a three year old son of GET STORMY, won a maiden special weight by 1-1/4 lengths at Fair Grounds on Friday going 1-1/16th miles on turf. The colt was bred by and is trained by Buff Bradley, who says that the colt will most likely go in stakes company for his next start. Dragon Drew is also a full brother to Storm the Hill, a graded placed black-type winner of $181,145. Go Noni Go, a two year old filly by GET STORMY, beat a salty Allowance field of twelve fillies on Sunday at Gulfstream Park. She now has a record of 7-2-1-1 and updated earnings of $98,645 for Three Diamonds Farm and Mike Maker. Go Noni Go was bred in Kentucky by David E. Hager II. Stormy Justin, a two year old colt by Get Stormy, won a $55,000 NY-bred Maiden Special Weight at Aqueduct on Sunday by 2-1/2 lengths going one mile on the grass.